Admiral Frax and I have been working on a new story game. It is a game of cosmic horror in an uncaring universe, for 2 or more players. It is called Lovecraftesque. What’s different about this game? This GMful game will see each of the players contribute clues which build up to a cosmic horror of your own devising. You won’t encounter Cthulhu, deep ones, mi-go or any of Lovecraft’s creations, but something fresh that feels like it came straight out of a Lovecraft story. You spend most of your time as a narrator whose role is to torment and frighten the protagonist of your tale. There’s no party of investigators, and the protagonist may be more interested in running away than uncovering what’s going on. The game owes a heavy debt to Graham Walmsley’s Stealing Cthulhu – it codifies and mechanises the ideas in that book, creating a story along Lovecraftian lines while leaving you flexibility to deviate from the formula when you need to. 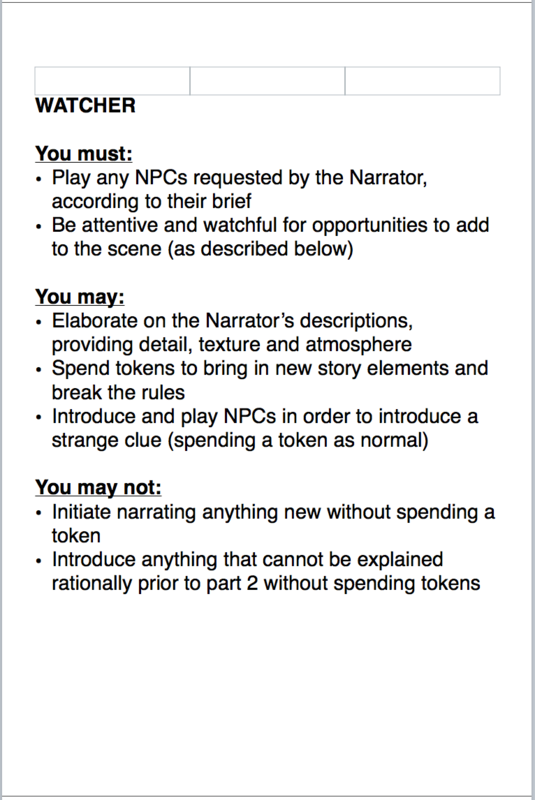 Here’s a little teaser of the game structure – more on the way.